It was days ago but still nibbles at my conscience. I snapped. I snapped out of guilt and my mulish inability to admit weakness. I snapped because I knew she was right, knew I agreed, and yet was a sucker for instant gratification. 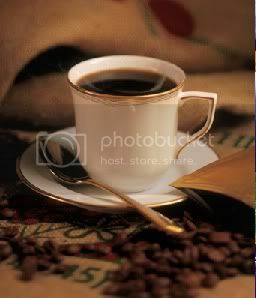 I snapped simply because I wanted a cup of coffee despite given it up weeks ago. I snapped as a disguise of vulnerability because holes in strength here hints at chasms on my soul, unveiling dire splinters in the show of ‘I’ve got everything under control’. I snapped because I like to be right...and because I knew I wasn’t. I snapped out of shame, the knowledge that I was not walking my own walk. I snapped as I ate my prior claims and taught by actions that my words should be suspect, fluffy promises that blow into whispers at the first shadow of pain. I snapped for all of the unsaid retorts, held-tongue moments, caught glances, and disapproving brows over the past week. I snapped for the child that pokes through snags in my adult cloak, for the challenge of coming home without allowing my feet to slip from equal ground. I snapped on impulse and immediately paid homage to the king of regret, desperately aiming to smooth bruised feathers without seeming obvious. I hate snapping. I hate that part that reacts in a flash; the porcupine spikes that line my truth with brick defenses long expired. I hate the harsh edges that slice innocent intentions and usually show up for air with those I love the most. I wish I were always sweet, easy, softly kind and patient, sinews of a best self missing a shadow side. In other words, I wish I wasn’t human. I wish for perfection while forgetting the complexities that compose my sonata, weaknesses that add depth, and emotions that transform the 2 dimensional into a twirling, glittering soul. I forget the shortcomings open doors for growth and vulnerability bridges connections. I forget that I have a universal choice. I can limit all interactions to sound bites of shiny niceness or float in the lull of togetherness long enough that pruney fingers emerge exposed. It’s easy to sit pretty for sips of time, but it’s a lonely life behind glass doors. The real gift is when we can be real; swapping laughter with irritation, disappointments with hugs, and pearls for pjs. The true connections come with snapping and apologies, frustrations and forgiveness. 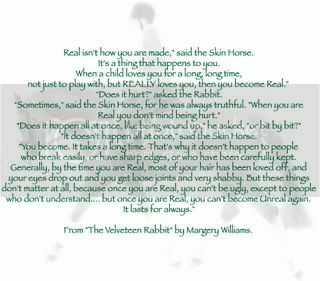 Like the velveteen rabbit who only becomes real once he is shabby and worn, I have to believe I am cherished because of my missing whiskers and matted fur instead of despite my stuffing poking out. It is in the real that I allow myself to be loved in, held in the rain, and to learn to accept my human parts. I snapped because I am human. I apologized because I care. And I let it go in efforts of acceptance.